Until I saw it for myself last week, I was pretty sure that Pokemon Go player-versus-player combat would never work. It's the missing piece for Niantic's immensely popular mobile game—one of a handful of features that makes Pokemon Pokemon—but it's also an odd fit for a game that's always been more about community than competition. It's hard to imagine what Pokemon Go PvP would even look like. Constant dodging? Rapid-fire switching in real-time? As it turns out, Niantic has been weighing many of these same problems as it has quietly developed its new Trainer Battles behind the scenes. "What does it mean to be 'good' at Pokemon Go?" Product manager Matt Slemon asked the assembled journalists in Niantic's San Francisco offices. Then Slemon answered his own question. "If you're goods at Raids and Gym Battles, you should be good at Trainer Battles," he said. Charge Attacks work very differently in Pokemon Go's Trainer Battles. Niantic's solution for PvP is elegant, surprisingly tactical, and very much in keeping with Pokemon Go's pattern for success. It's a 3v3 system that brings with it a few key changes to the traditional Pokemon Go battle system, the biggest being the way Charge Moves work. Battling willl yield rewards much like sending gifts to friends, and will be one of the main ways going forward to earn evolution items like Sinnoh Stones. If you have no friends who play Pokemon Go, you will be able to challenge AI gym leaders instead. 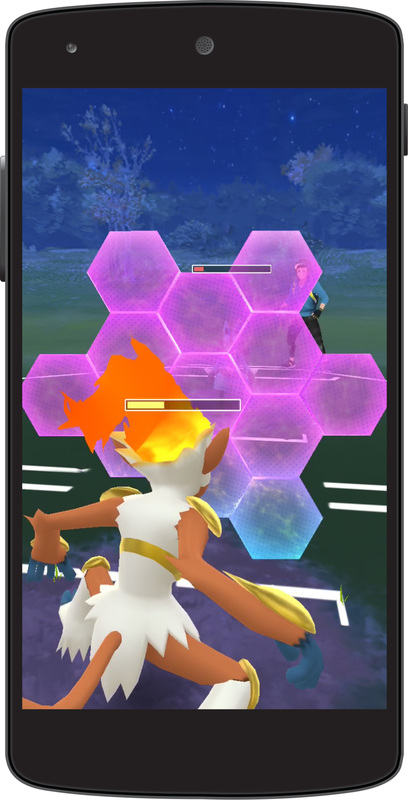 The actual combat is much slower-paced and more tactical than Pokemon Go's Raids, where trainers often find themselves hammering at their screen while swiping left and right to dodge big attacks. Dodging is gone in PvP, replaced with a countdown that freezes the action and offers the option to activate Protect. Protect will nullify almost all of the damage from a Charge Attack like Outrage or Fire Blast, but you can only use two per match, so it's often wise to keep at least one in your back pocket until the end of the match. As in the main games, type matchups matter in Pokemon Go, often necessitating a switch against an unfavorable opponent. But because Pokemon Go's combat mostly takes place in real-time, switches are restricted with a cooldown timer. This forces you to make a couple big decisions during battle: when to burn a Protect, and when to swap out a monster for a more favorable matchup. It's obviously nowhere near as deep as the mainline RPGs, where abilities, traits, movesets, and hidden stats all come into play, but the battles are quick, and they have at least a little bit of depth. I actually prefer them to 3v3 in the standard games, where one unfavorable matchup has the chance to completely wreck your chances. In Pokemon Go, even stronger monsters can be overcome with the judicious application of Protect and some well-timed Charge Attacks. And with the cooldown timer, it's much less switch-heavy. I wound up playing a bunch of battles at each of the three main tiers, which cap the power of your Pokemon at 1500, 2500, and 5,000 respectively. As you might expect, the top tier is something of a legendary Pokemon fest dominated by the likes of Mewtwo, while the lower tiers are a little more balanced. I actually prefer 1500, as it's the tier were you're likely to see the most interesting monsters. Like its popular Friends list, Pokemon Go's PvP is built around daily logins, with battles yielding up to three items (A.I. battles only offer one reward) plus progress toward the formerly retired Ace Trainer badge. If battling against a friend, it will also produce a friendship increase in-game. Local battles take place via QR code, with remote battles being restricted to Ultra Friends and above. Gen 4 Sinnoh Pokemon are a recent addition to Pokemon Go. PvP and PvE communities are often at odds with one another, but it's hard to imagine much friction in light of the mode's accessibility and the rewards involved. Even those players who have no interest in PvP can look forward to the forthcoming ability to unlock a second Charge Attack, which will be useful for Raids and Gyms. In the spirit of Pokemon Go, even the PvP feels more cooperative than competitive, with players teaming up to battle for the prospect of mutual rewards. According to Niantic software engineer Rob Giusti, one of the guiding principles of PvP in Pokemon is that no one should ever have reason to say "no" to a battle. Both Giusti and Slemon say this is only the beginning, with more complex mechanics set to appear over time. For now, Niantic is focused on getting the foundation in place. "It's important to ensure that Pokemon Go feels like Pokemon Go," Giusti says. We don't have a firm release date yet, but Niantic says it will be out later this month. Expect it in the next couple week, and in the meantime, make sure to check out our Pokemon Go guide to the Sinnoh region monsters and more. Tagged with Feature,	ios,	Niantic,	Role Playing Games.